Newcastle United teenagers Jack Robson and Adam Wilson both hit hat-tricks as the Magpies hit cloud nine. After a disappointing defeat at the hands of Antrim yesterday, the young Geordies turned on the style in the Premier section of the SuperCupNI, beating Chinese club Morning Star United 9-0 at the Riada in Ballymoney. Matthew Longstaff opened the scoring from close range before Kieran Alpin scored a header. Both Wilson and Robson scored headers to make it 4-0 before half-time and they scored again beforeDeese Kasinga Madia rounded the goalkeeper and slotted the ball home for seven. Wilson was the first to complete his hat-trick, scoring from the spot, before Robson completed the scoring with four minutes left on the clock. Newcastle weren’t the only high-scorers in Tuesday’s round of Premier section fixtures. Chilean side O’Higgins had far too much for County Tyrone, winning 6-0 at the Coleraine Showgrounds. African Academy side Right To Dream also racked up the goals against a county side. They made short work of Fermanagh in Broughshane, winning 5-0. Brazil side Osasco had to settle for just the one goal, defeating American side Strikers 1-0 in Portrush. In an all-American clash, First Choice Soccer defeated GPS Bayern 3-1 in Portstewart. 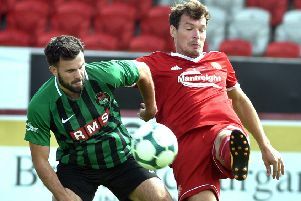 The touring First Choice side are managed by former Bangor boss Frankie Wilson, and have several Irish players in their squad. Both Armagh and Down had to settle for scoreless draw. Armagh couldn’t break down Japanese club Komazawa, while Down failed to net against French club Vendee. Two other county sides suffered narrow defeats, in what was a difficult day for the local teams in the Premier section. New Zealanders Otago defeated Londonderry 1-0 in Portstewart, while 2015 winners Antrim lost 1-0 to Mexicans Club America. It was sweet revenge for the Club America, who were the defeated finalists two years.